Before World War II, before she became a fashion icon, Judith Leiber, who died on Sunday, April 29, at age 97 - a few hours after the passing of her husband of 72 years - made high-end handbags in Budapest, Hungary. During the Nazi occupation, she survived with her family in a Jewish ghetto, dodging deportation with a Swiss schutzpass that she managed to acquire through a friend. When the war ended, American G.I. and aspiring artist Gerson ‘Gus’ Leiber swept the young designer off her feet, and the two returned to America together. Judith Leiber worked for other handbag makers in New York for 12 years until she started her own luxury brand in 1963. She became famous for her minaudiéres – small, ornamental cases just big enough for a woman’s bare essentials. Leiber’s crystal-covered creations - some of which sell for more than $5,000 - are often shaped like animals and foods, and are considered a status symbol from Hollywood to the White House and around the world. 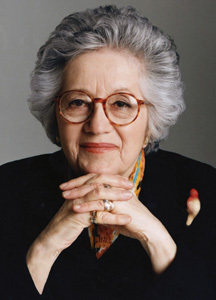 Leiber sold her company and retired in the 1990s. In 2005, she and her husband, a painter and sculptor, opened The Leiber Museum in East Hampton, N.Y. Her work is on permanent display at the Smithsonian in Washington, D.C. and New York’s Metropolitan Museum of Art. Leiber was the subject of the 2009 book No Mere Bagatelles by Jeffrey Sussman. Budapest was known for being a place of incredible creativity in the prewar years. Was that culture-rich environment a factor in your choice of careers? 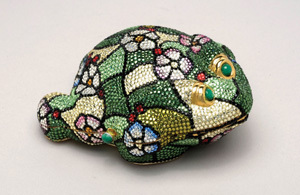 Judith Leiber: Well, I wasn’t in the handbag business in the prewar years. In 1938 my parents sent me to London to study for the matric for Kings College, where I was to study chemistry, and I passed that and went back to Hungary. Then the war broke out and I couldn’t go to England anymore. So I learned to make handbags. I became an apprentice and a journeyman and a master. I learned the trade from start to finish. You were the first woman apprentice at Pessl, the most prestigious handbag company in Budapest at that time. Did you feel like a pioneer? JL: No, I wasn’t thinking about that at all, I just went and did it. Did you encounter any roadblocks when you started building your career as an immigrant in the U.S.? JL: I came to the States with my husband, who was a G.I. and then went to study art in New York. At my first job they said I had to use a sewing machine. I only knew how to use a manual sewing machine, not electric, so they kicked me out. Then I went to the handbag association, where the director was a very nice man named Berkowitz. He said that his son was a designer at a cheap handbag company. I worked there a while, but one of the sewing machine operators said to me, “You don’t belong in this kind of a place; it’s too low-price. You should go to the union.” I spoke to the union president and told him that I could do everything in the trade, and he said, “I’ll send you to the best company, called Nettie Rosenstein.” I worked there as an assistant patternmaker until the man who was the chief patternmaker got sick – and after that I did everything. So I worked there for about 12 years, and then the company closed in New York. I worked for Koret for six months, then Morris Moskowitz for about two years, and finally my husband said, “You’re not going to be working for anybody else. You are going to go into business for yourself.” I was scared to death, but we did it, and we were very successful – lucky me. Was it a struggle to build your own brand? JL: We did it little by little. Our first loft was only 280 square feet and we had about four employees. I did all the patternmaking and the designing, and I also did some of the work myself. Then we went to a larger loft, which was maybe 800 feet, then we needed more help and we moved to 31st Street in a building that had a bigger loft, 1,700 feet. We worked there for a while. Finally we went to 20 West 33rd Street, where we worked until I sold our company. I kept working for the company for five years, and then I retired. But we were very successful. We did a nice business. It was not a large business but we were doing some very different things from most people. All the big stores bought our bags – Neiman Marcus, Saks, Bergdorf Goodman… We did very nicely over the years. I was very talented in that business. But as my husband says, “Half of our success is luck.” We were very lucky. How did you develop your signature bejeweled handbag style? JL: The rhinestones actually started when I made a little purse-shaped bag that I wanted to sell in gold and silver plating. Ladies used to run to the bank every time they needed a handbag, because their gold bags were there. We made things out of gold- or silver-colored brass. When the metal-plated bags came in from Italy they were all spotted – they looked terrible. So I covered the plating with rhinestones, and that started a new trend. We made many shapes, and we also did very simple bags. It was very successful. As your star was rising in fashion, who inspired you? JL: Many of my designs were inspired by great 20th century artists – such as Mondrian, Sonia Delauney and Braque. So many women of note have carried your bags, from first ladies to movie stars. Which clients have made you the most proud? Jeffrey Sussman: Beverly Sills, the opera singer, owned more than 200 Judith Leiber bags, and she was a very close friend to Judy, as was Barbara Bush. JL: [Beverly Sills] told me she was going to leave all her bags to me, but after she died, her daughter only gave me about four. Two of them were completely used up, they looked very bad. One bag had her initials on it and was covered in solid rhinestones. That was a very nice little bag; I have it in the showcase in my museum. 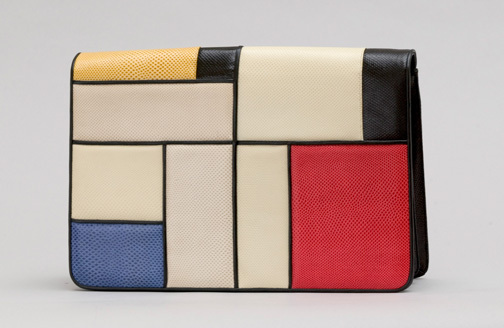 Leiber considers this Mondrian bag to be one of her most inspired pieces. She designed 3,500 unique handbags throughout her career, and now displays a little more than 1,000 of the originals at the Leiber Collection museum in East Hampton, New York. When I worked at Nettie Rosenstein I made a bag for Mamie Eisenhower. After we went into business, we made all the bags for all the presidents’ wives – except Mrs. Carter. She didn’t want a bag from me. But all the other ladies had my bags, and we even made some for them for inauguration day, not just for the big party. But all the big party bags I made in metal with different rhinestones. For Mrs. Nixon, I made a bag of the fabric that her dress was made of. For Hilary Clinton I made the gold beads on the whole bag because her dress was gold Oscar de la Renta, all different patterns, very pretty. Unfortunately it was never used, so I have a feeling that she still owns it. I made a bag for Mrs. Bush – senior – and she was very nice to everybody who worked with her. She invited everyone who worked on her dress to a party at the White House. It was Isaac [Mizrahi] who did the dress; he gave me fabric for the bag. Later I made a bag that looked like her Springer Spaniel; she loved it. She wanted to have little ones she could give to friends, so I made pillboxes of the dog bag, and she gave them as gifts. Which bag was technically the most challenging to create? JL: Well, I don’t know… I have a very good sculptor. I gave him the ideas and he made the model for many different things that I did. I took those waxes to Italy and they covered it with Gesso, and then they made a brass model out of it. I made a cat, a teddy bear, a swan, a penguin – the company keeps selling the penguin. I also made a pillbox of the penguin, which also sold very well. Those are comparatively low prices – the pillboxes are a lower than the bags, they’re about 230 dollars retail. We made many models, all my designs, and most of those I did with that sculptor because the shapes were such that you couldn’t do it any other way. I made many bags that were simple in shape with interesting flowers and things on top. What do you say to women who think your bags are impractically small? JL: All you need is a lipstick, a compact and a $100 bill – in case your boyfriend or husband doesn’t want to take you home. Now you’ve opened a museum in East Hampton to feature your work and your husband’s art. Are the bags on display from your personal collection? JL: Some people presented the bags to me. We bought some bags at different times from Christie’s and Sotheby’s, because they were my bags that we didn’t own. I got some of them on eBay and different auctions. JS: We had about 200 people come to an opening of the museum on Memorial Day weekend. Judy was there the entire time: She greeted everyone who came to the museum and answered all their questions, and was a very gracious host. JL: It was a wonderful opening. The first day was rainy, but people didn’t care, they came anyway. The next day was sunny, and we had over 100 people that day too. The museum is a very beautiful building. Right now the whole museum is my work. Next year my husband’s work will be back on display and it will be very interesting too. We’re hopeful that all this is going to be very successful. How We're Working to #ChangeTheCulture - and you can join us.